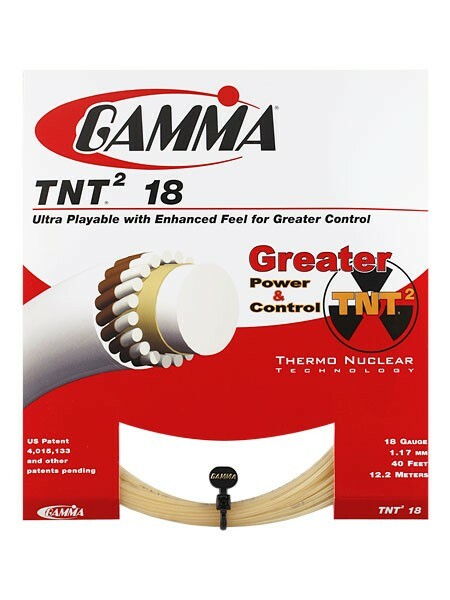 Improving on the popular TNT string, Gamma TNT2 is the top all around string for power, feel, and control. Improving on the popular TNT string, Gamma TNT2 is the top all around string for power, feel, and control. The second generation Thermal Nuclear Technology results in greater elasticity for more power and comfort from a solid core construction. TNT2 features an Elastilon 2 polymer central core for enhanced power and ball pocketing. The monofilament central core construction aids tension maintenance while the outer wraps soften the feel for even greater comfort. A great string for players seeking comfort and power without having to use a multifilament string.